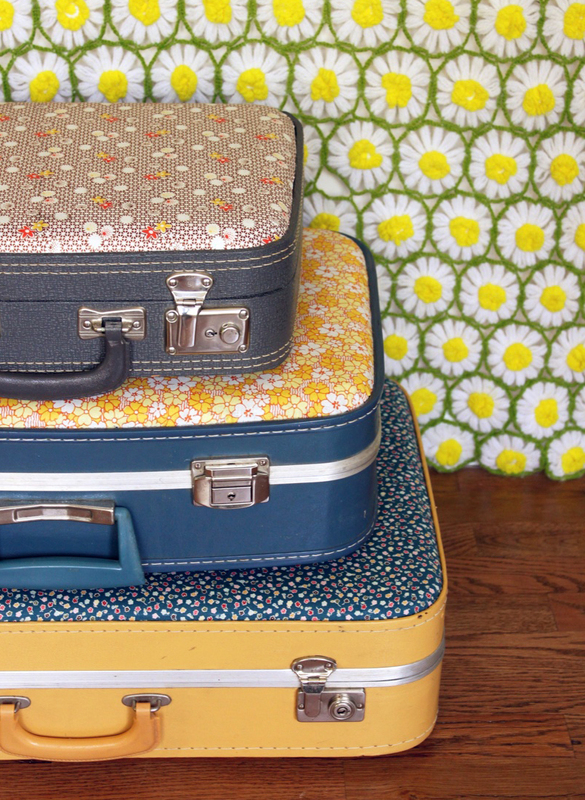 Vintage suitcases aren’t very practical for traveling with these days, but they do look good! They are heavy and don’t have inbuilt wheels. Lugging them around is like a gym workout. Now everyone wants a modern suitcase with wheels just to save their backs if nothing else. That’s why train stations and airports used to be full of porters ready to carry your luggage for you. I can’t remember the last time I used a porter, do they still exist? 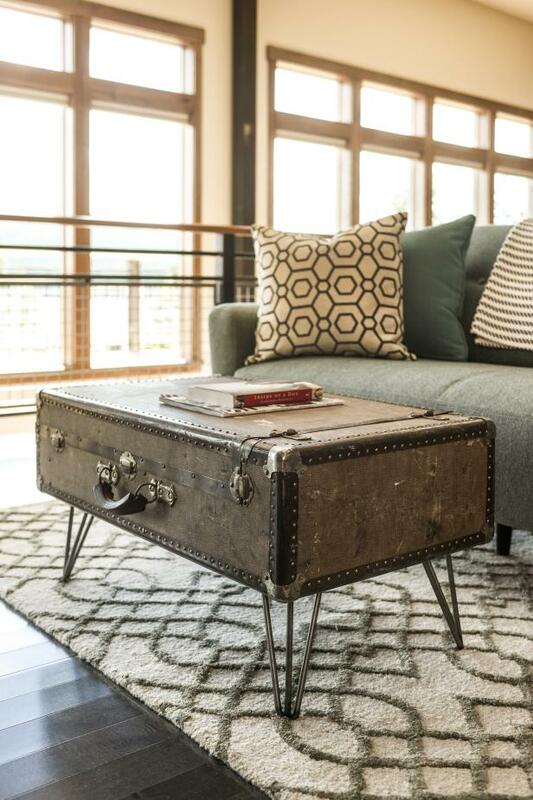 However, there is something very charming and appealing about vintage suitcases, that’s why they look so great revamped into some sort of home decor item. I’m always picking up vintage suitcases for next to nothing. They are one of my favourite things to upcycle, I’ve got a few sitting in my loft at the moment waiting to be pimped. This is definitely one for those with wanderlust. 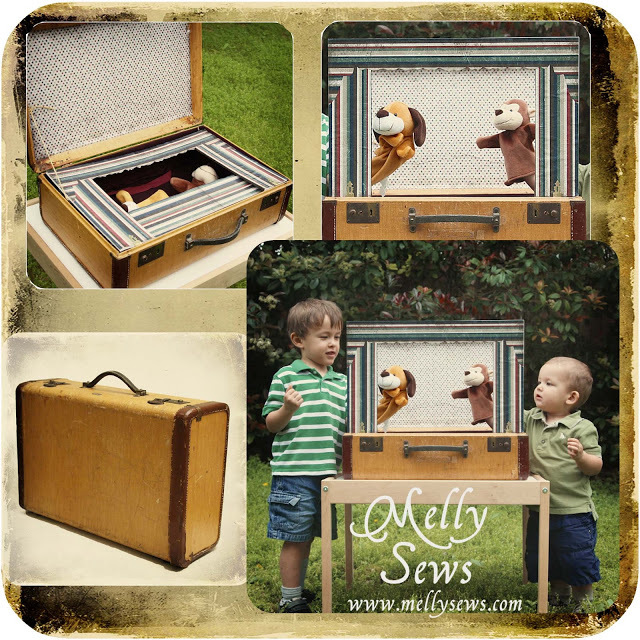 Just adding a world map to both the inside and outside transformed a vintage suitcase into something awesome. 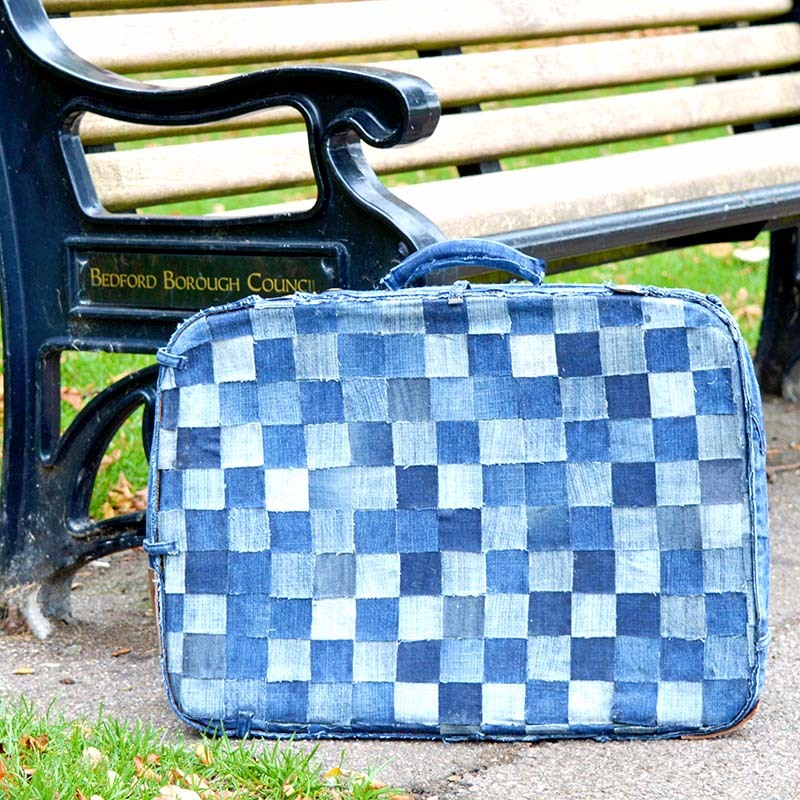 Just add a pair of old jeans, this is a great way to transform a vintage suitcase that has seen a bit of wear and tear. No sewing involved either. These suitcases are just so colourful and gorgeous. I love the contrast of the chunky legs with this suitcase and the luggage tag detail. This would look awesome in any entrance way. How about making some fabulous unique shelves with old cases? 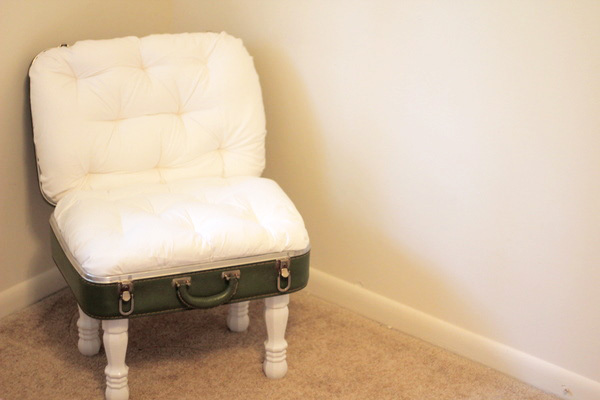 As well as adding little legs, upholster the suitcase to create a cute little chair. Old suitcases aren’t just for grown ups, they can be adapted for pets too! This is such a cool bedside table for those with wanderlust. Comes with handy storage too! 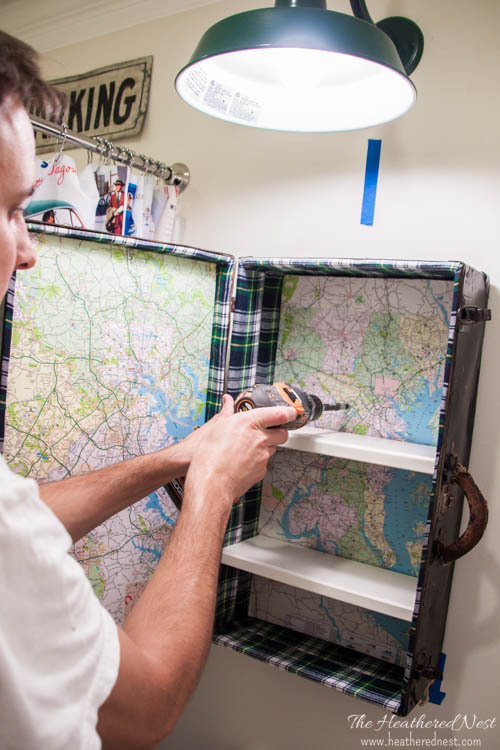 This has got to be one of my favourite suitcase upcycles, and I just love the map lining. Great tutorial too! Add hairpin legs and hey presto you have a table! My kids would have loved one of these puppet theaters when they were younger. Another one for the kids. This is just so freaking adorable, I wish I had a little kid to make one for. You could even do a superhero lair version, just change the chalkboard on the outside to suit. 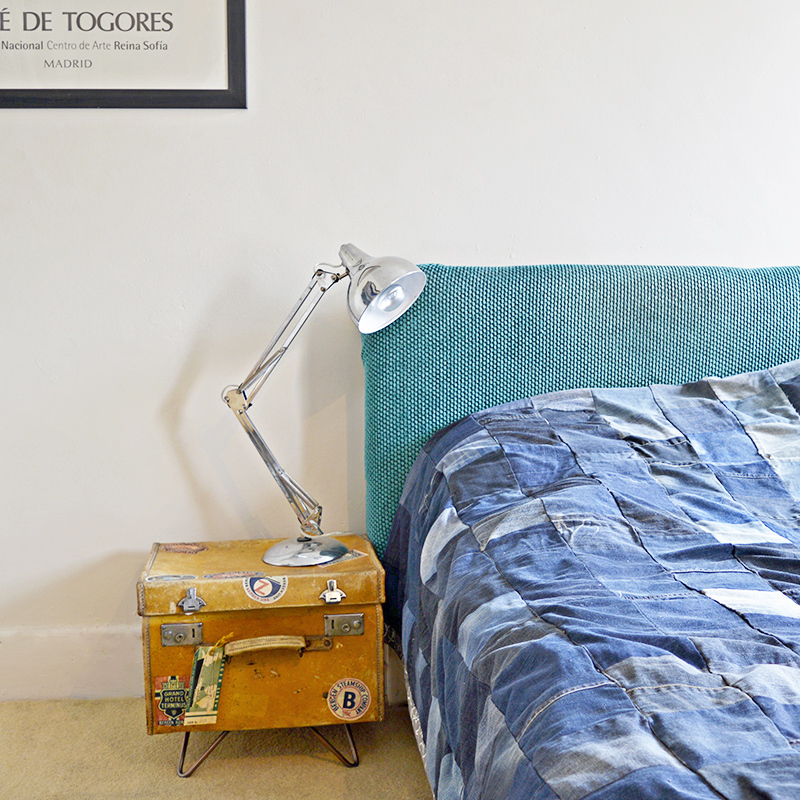 Hopefully, you have found something to inspire you to upcycle a vintage suitcase. Part of the charm of old suitcases is their battered and worn look. However, if your suitcase has been a bit too much in the wars, then don’t forget to decoupage, it can hide a lot of damage. 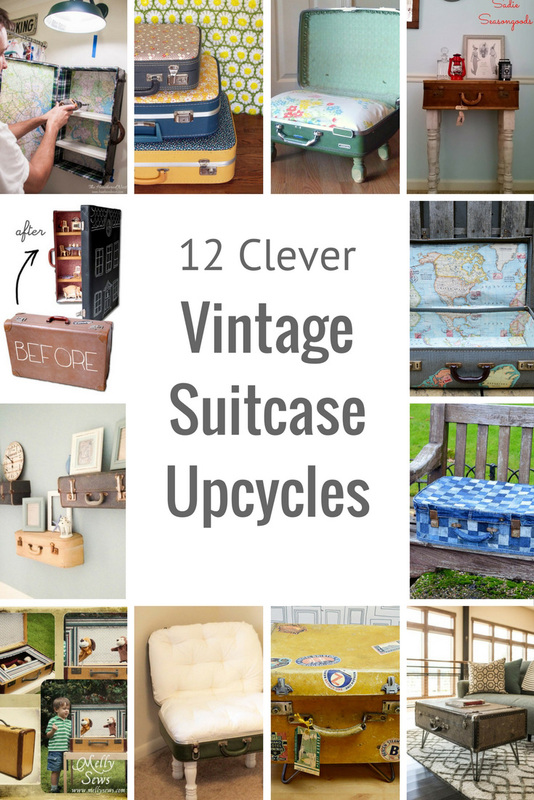 So many great ideas for Vintage Suitcases! Love them all!! i love the one with the map! such great ideas! Thank you, I love the map one to it sits in my fireplace. Thank you! I have an auction house near me and they come up regularly. I’ve actually got one sitting in my loft waiting to be upcycled. These are all fabulous projects. I can not pass up a vintage suitcase when I come across one. Thank you, Sherry. I find them hard to resist too! 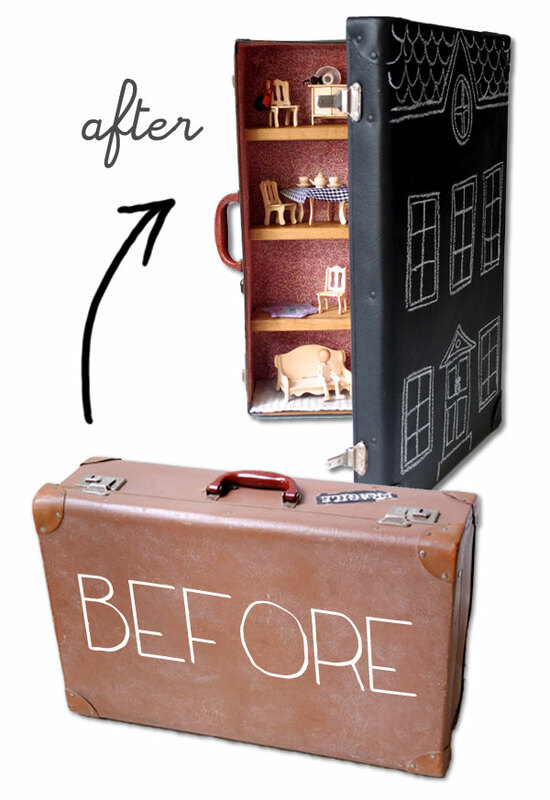 Thanks for including my suitcase doll house in your great roundup. Your doll house is such an adorable idea! I love the suitcases on deroration and espcially these with maps!! !The idea with the dollhouse very nice!! !Have a nice day!!! 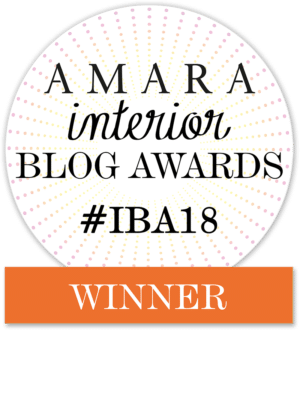 Thank you, the dolls house is a great idea! These are all fantastic ideas! I love that puppet theater one (and all of the other ones, lol). These would make great upcycled gifts. Thanks for sharing your round-up with us at Merry Monday this week! Thank you, the puppet theater is lovely. Those shelves are outrageous! You think of everything and may I borrow your creative cap for a while? I promise to give it back. Thank you for sharing with us this week at Celebrate Your Story, and I hope your week is going great. Thank you so much and my week is going well so far. 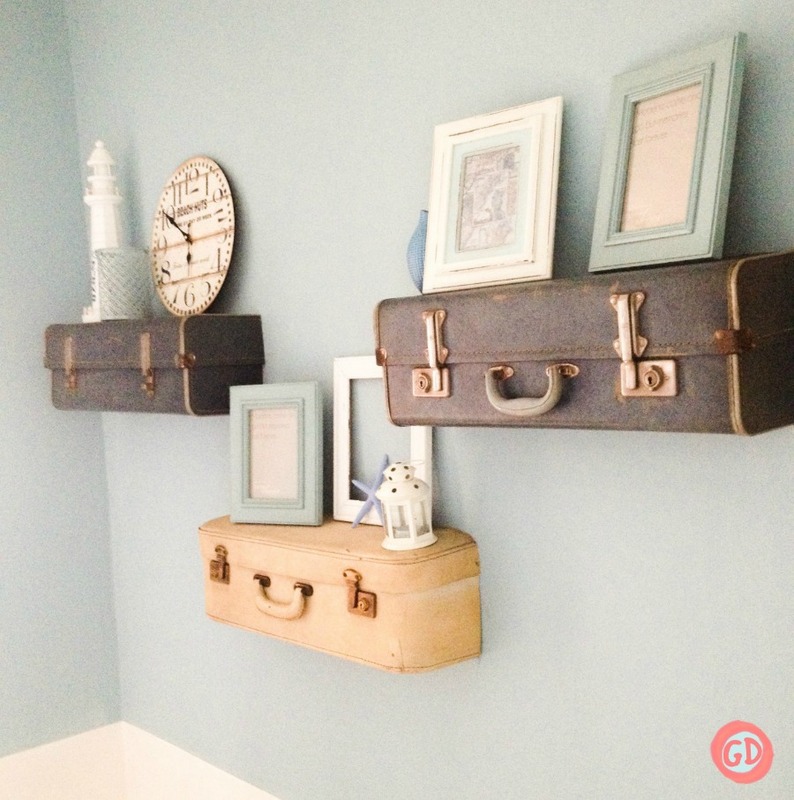 These are such clever up-cycling projects with old suitcases. 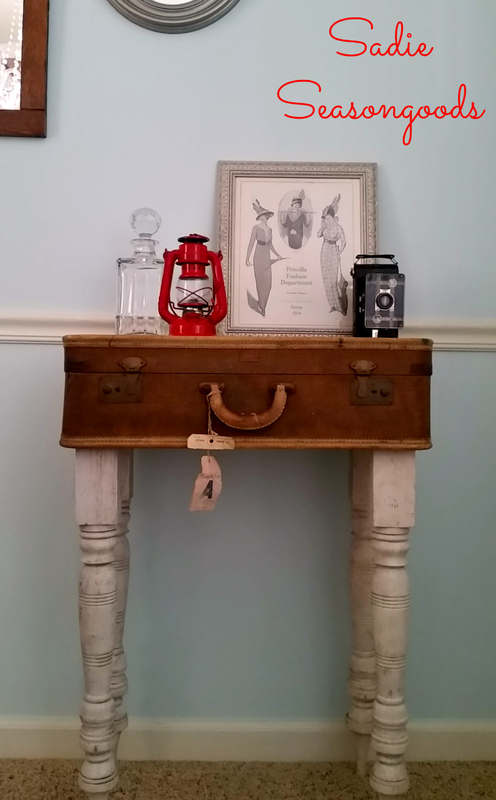 It’s interesting to see how creative bloggers can be when re-using old objects in new ways. Thank you, yes it’s amazing all the different unique ways that people come up with when recycling the same thing. Fun ideas. Vintage suitcases make me muse about where they have travelled to. They are perfect in a Den, I especially love the large trunk coffee table, its gorgeous. Thank you the coffee table does look good with the hairpin legs. Thank you, I think the doll house is an ingenious idea. I love decorating with vintage luggage! Thanks for sharing @Vintage Charm! so many cute ideas here. I think the blue jeans might be my favorite. Thank you, I use the blue jeans one for storage but have it on show. You always have the cutest and most original projects! Loved your round up too! Thank you Carrie that is very kind of you. 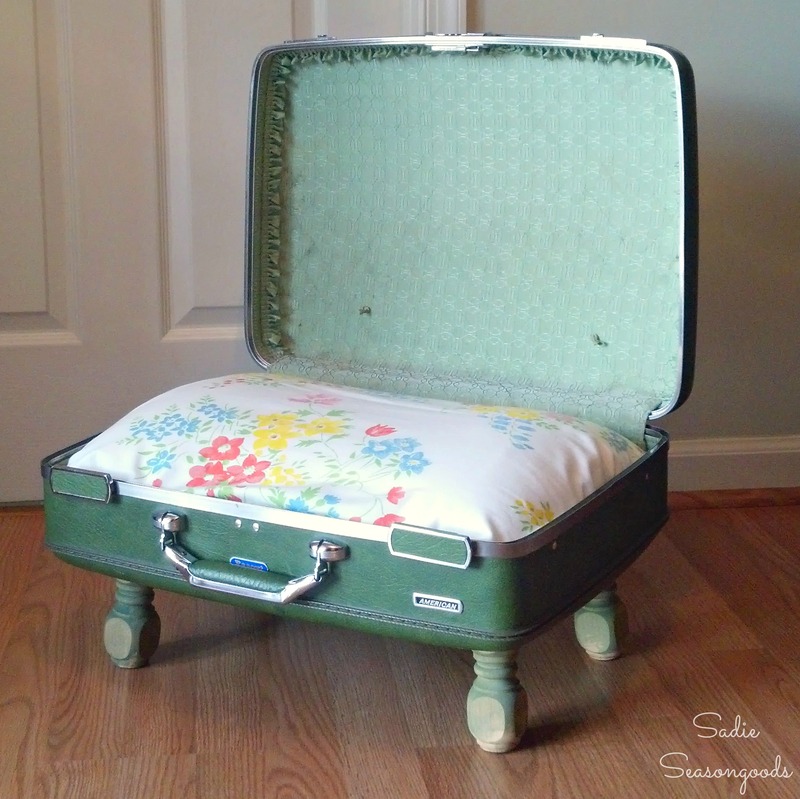 What a fantastic idea for up-cycling vintage suitcases! My favorite Is #4 Vintage Suitcase Side Table. Thank you so much. I love the side table too it’s in my bedroom. Oh my heavens, what fun projects…can’t chose my favorite…maybe the shelves with the cut off suitcases. Thanks, the shelves do look fun. These are awesome! I love the ones with the maps and that coffee table – swoon! I’m visiting from Wonderful Wednesday Link Party. Thank you! The coffee table does look great.